This is one of my favorite green forest hikes along a river. The trail parallels the Wild and Scenic Salmon River for several miles before climbing to a viewpoint of the canyon. A recent wind storm caused a LOT of blow down on the trail. It was a bit like an obstacle course. Nesika Lodge is in the Columbia River Gorge’s Multnomah Basin. Starting at Multnomah Falls, it’s a 4 mile hike up with 1,800 feet of elevation gain. I spent my birthday hiking alongside Multnomah Creek, starting at Multnomah Falls and finishing with a post-hike lunch in the lodge. This section of the Klickitat River Trail is near where it enters the Columbia River at Lyle, Washington. Beginning at the Top Spur trailhead, we hiked around Bald Mountain, along Bald Mountain Ridge and up to several tarns below McNeil Point. 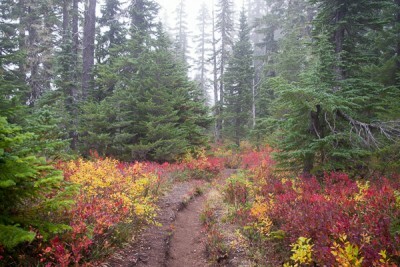 In early October, there were nice fall colors along the trail. 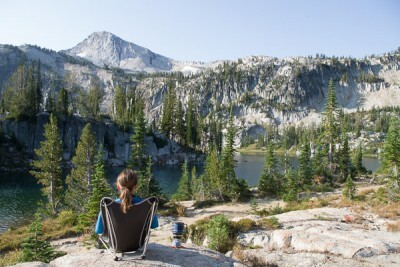 Beginning at the Thomas Lake trailhead, we hiked in to Blue Lake for a one night backpacking trip. Garfield Peak is located next to the Crater Lake Lodge. Panoramic views in all directions from the top are worth the moderate hike up. Hike on a volcano within a volcano at Crater Lake.